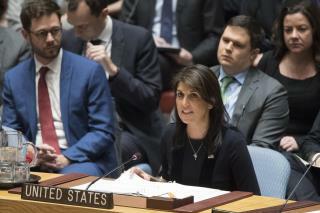 (Newser) – Nikki Haley came out strong against Russia and in support of the United Kingdom on Wednesday following the nerve agent attack that left a former Russian spy and his adult daughter in critical condition in England, CNN reports. "The United States believes that Russia is responsible for the attack," the US ambassador to the UN told the Security Council, adding the White House "stands in absolute solidarity with Great Britain." "Time and time again, member states say they oppose the use of chemical weapons under any circumstance," Haley said. "Now one member stands accused of using chemical weapons on the sovereign soil of another member. The credibility of this council will not survive if we fail to hold Russia accountable." Not sure why anybody could believe that the President would have an affair with this disgusting old woman. If he actually wanted to cheat on his wife (and I don't think he ever would), doesn't he know a lot of former beauty pageant contestants? I'm increasingly concerned this is all a setup for an easy target and an easy patsy. Countdown to Nikki's firing....five, four, three, two, one. Anyone that speaks the truth in Trump's administration gets the ax.